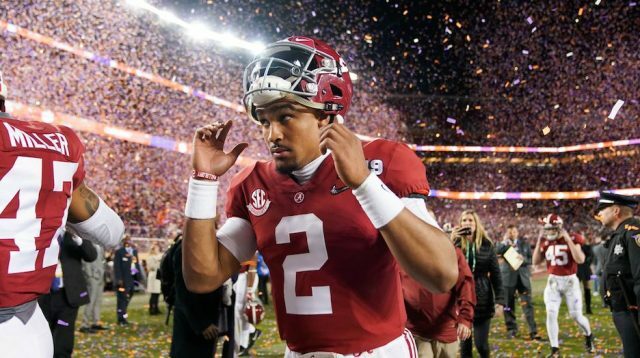 The NCAA transfer portal extravaganza continues as Alabama Crimson Tide quarterback Jalen Hurts announced via the Player’s Tribune that he will be transferring to Oklahoma for the 2019 season. Hurts spent his first three years of eligibility under Nick Saban at Alabama, but due to the emergence of Tua Tagovailoa, he lost the starting job at the beginning of the 2018 season. In two years as the starting quarterback, Hurts led his team to back-to-back National Championship appearances which he lost to the Clemson Tigers and was benched vs. the Georgia Bulldogs respectively. Although he served as backup for the duration of 2018, he did engineer two late scoring drives in the SEC Championship game after Tagovailoa suffered an ankle injury. He has accumulated 5,626 yards passing alongside his additional 1,976 on the ground over the course of his three-year career. Those numbers are likely to skyrocket as he begins to face Big 12 defenses rather than the juggernauts of the SEC. This transfer marks another high profile move, the third in about a month as Justin Fields and Tate Martell have shaken things up over at Ohio State. The former five-star prospect, Penn State commit, and Georgia backup Justin Fields announced he will be transferring to the Buckeyes in hopes to play in the 2019 season. As a result, Tate Martell, who was expected to take the reigns from Dwayne Haskins in 2019 will be transferring to Miami with hopes to play by the 2020 season.